In Korea we used really rough texture of scrubbers to remove the dead skin. In my case I stopped for 5 years to scrub with the official green towel found in Korea. I always used body scrub. The reason why I changed is that scrubbing with the green towel is too strong that removed all the dry skin that suppose to left behind as well as making the skin very dry. So it speeds up the aging. 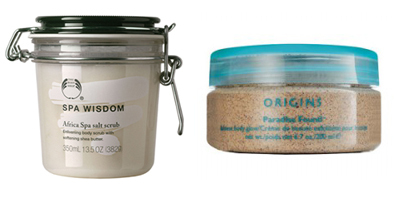 So as soon as I heard about aging I started to use body scrub. I used various samples from different brands and choosing between two is truly difficult. So from here follow your personal taste and ideal in picking. The name is so long and this is the product that I used for several years. Many Body Shop Maniacs are using this product and it can be said to be the representing product in Body Shop. Even though it contains salt the texture is fine and very soft. It states it helps to release waste but I can't see it through my naked eyes but it sure helps to remove the dead skin. I used this product for about 5 years and for daily wash I use body wash or shower gel. I use the scrub two times a week and it really makes my skin flawless. After shower use body lotion for moisturizing is needed. Doing the scrub in face and doing it for the body helps to shine. This product makes the skin shining due to extraction from papaya and mango. I heard from a salon that many celebrities use this product and these days I saw this product on the magazine introduced by celebrities. This product is good as Body Shop scrub. Body Shop scrub is softer but for shining Origins is the best!! When you search in the internet it is cheaper than the actual shop BUT check the expiration date.